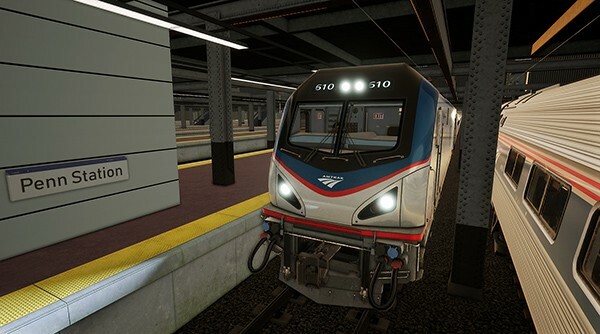 This new Train Sim World route will re-create some of the busiest trackage on Amtrak’s famed Boston – New York – Washington, D.C., Northeast Corridor, with the route’s featured portion of the “NEC” extending from near Newark Liberty International Airport in New Jersey to the Amtrak/Metro-North station at New Rochelle, New York. And in between these end points awaits Amtrak’s busiest and most famous rail station – New York Penn which hosts more than 10 million Amtrak passengers annually – as well as classic Newark Penn Station and the Secaucus station (served by NJ Transit). In addition to busy New York Penn Station, the “Big Apple” is home to Amtrak’s sprawling Sunnyside Yard complex in the borough of Queens, and famed Hell Gate Bridge, which stands 135 above the East River and (with approaches) measures more than 17,000-feet long in taking Amtrak’s Hell Gate Line from Queens to the Bronx. 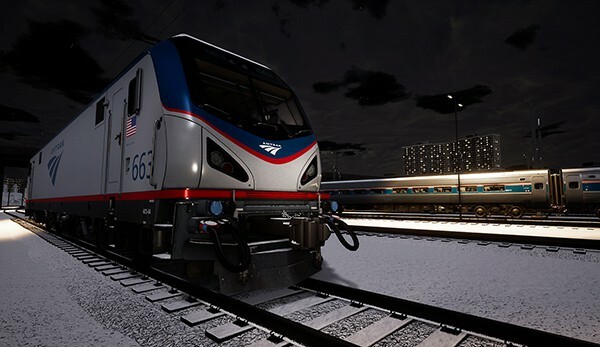 As an engineer on the Train Sim World Northeast Corridor New York route, you’ll be climbing aboard a detailed and authentic Amtrak ACS-64 “Amtrak City Sprinter” electric. As constructed by Siemens Mobility between 2013 and 2016, the ACS-64 is both sleek and powerful. 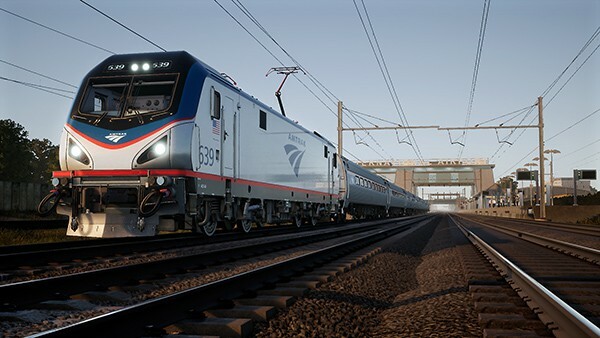 Riding on a four-axle (B-B) wheel arrangement, the Amtrak City Sprinter measures 66-feet long, weighs 215,537 pounds, and features a monocoque body and double-cab design. 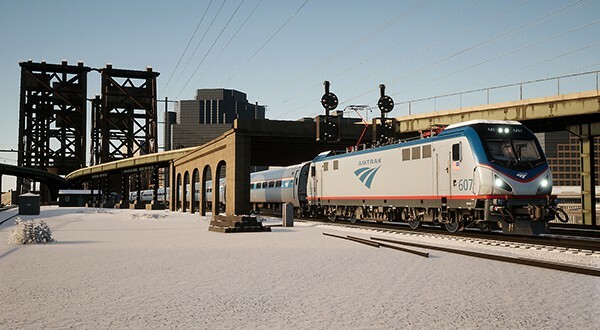 The ACS-64 produces 8,600 horsepower (6,400 kW) in maximum output, has a continuous rating of 5,000 kW (approximately 6,700 horsepower), and is permitted to operate at speeds up to 125-mph on the Amtrak Northeast Corridor. 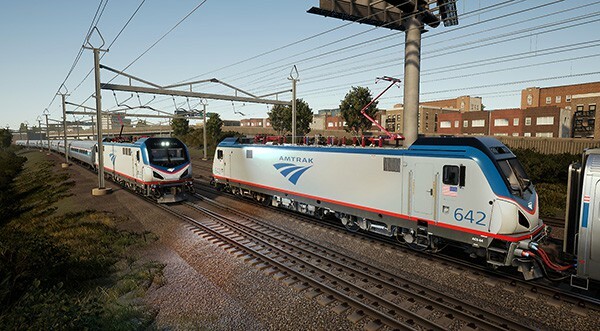 Accompanying the flashy ACS-64 on the Northeast Corridor New York route will be Amtrak’s workhorse Amfleet I passenger equipment, including standard coach, business class, and café car versions as are the standard equipment on Amtrak’s Northeast Regional trains. 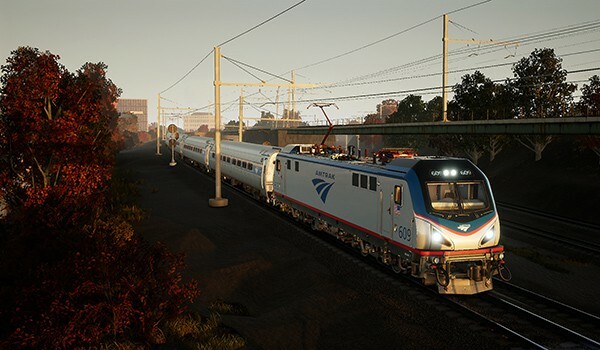 Taking the controls of Amtrak’s ACS-64 in a variety of scenarios (including an ACS-64 tutorial and three full-length scenarios) along with a wealth of “service mode” schedules will provide a variety of passenger-service operating challenges – and Northeast Corridor New York will also put you to work handling CSX freight duties. 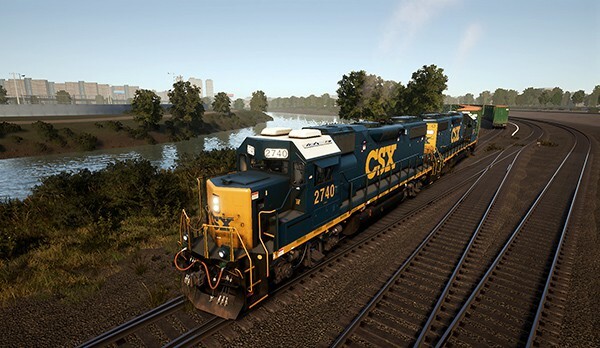 As earlier detailed in the article “Big Apple Tonnage”, the Train Sim World Northeast Corridor New York route will feature a diversity of notable freight locations and operations, including three major yards (Oak Point and Harlem River in the Bronx and Fresh Pond in Queens), multiple lineside shippers including the Waste Management Harlem River Transfer Station and massive Hunts Point Produce Terminal in the Bronx, and the freight-only line over Hell Gate connecting with the CSX’s Fremont Secondary to Fresh Pond in Queens. 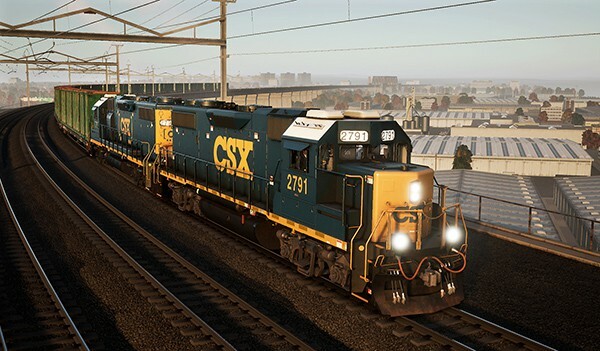 Providing the power to move tonnage over the Northeast Corridor New York route will be the versatile CSX Electro-Motive GP38-2 road-switcher, which will be dressed in CSX’s “YN3” livery. 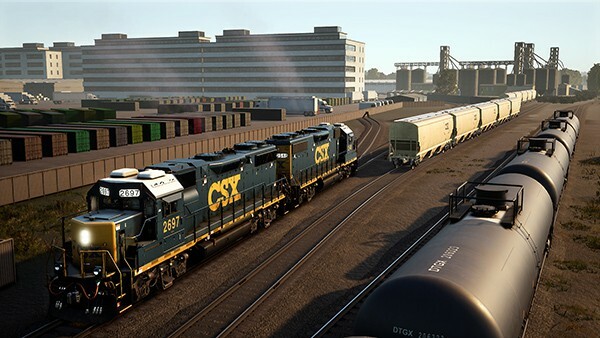 And joining the CSX GP38-2 will be a selection of freight rolling stock, including an 85-foot trash-carrying flat/container car, CSX 50-foot Plate C boxcar, 5201-cubic-foot covered hopper, 30,500-gallon tank car, and 73-foot centerbeam flatcar. 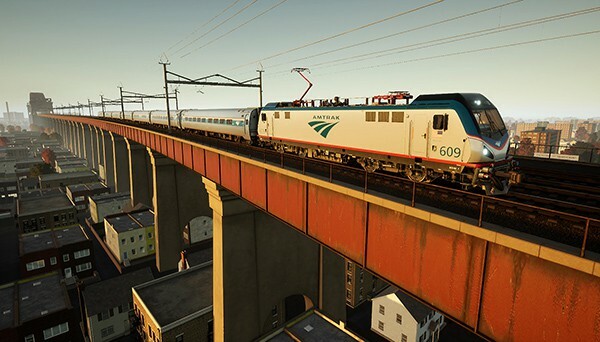 The drama, challenges, and variety of contemporary “Big Apple” railroading is coming soon to Train Sim World with the “Northeast Corridor New York” route. As the evening sun sets over the Big Apple, Amtrak ACS-64 610 has exited the East River Tunnels in Queens and is bound for Boston with an Amfleet I-equipped Northeast Regional train. Screenshots by Gary Dolzall. 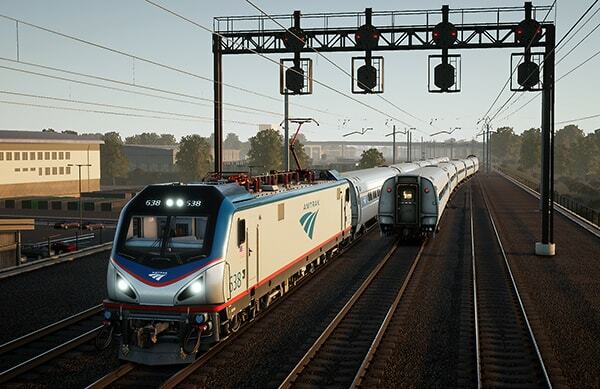 Siemens-built “Amtrak City Sprinter” 642 has just departed New Rochelle (New York) station and meets a northbound Northeast Regional train at Shell Interlocking, the junction between Metro-North’s New Haven Line and Amtrak’s Hell Gate Line. Note: Screenshots depict content still in development. Hustling an evening train toward New York Penn Station, Amtrak ACS-64 609 leads the way across Hell Gate Bridge (above) which, with its approaches, stretches more than 17,000-feet-long and carries the Northeast Corridor over New York’s East River. A short time later, the Northeast Regional train is making its way through Queens (below). Night has fallen in the Queens borough of New York City as Amtrak City Sprinter 663 settles in at Amtrak’s massive Sunnyside Yard. 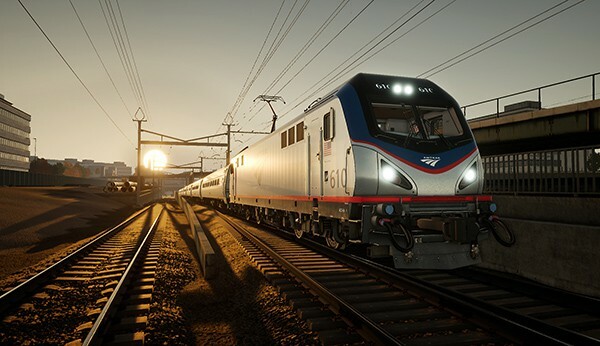 The ACS-64 features a monocoque body and double-cab design, produces 8,600 horsepower (6,400 kW) in maximum output, and is permitted to operate at speeds up to 125-mph on Amtrak’s Northeast Corridor. New York Penn Station, located in the heart of legendary Manhattan, is Amtrak’s busiest and arguably most famous rail station. More than 10 million Amtrak passengers utilize New York Penn Station per year. ACS-64 610 is standing alongside one of the station’s 11 underground platforms which serve 21 station tracks. On a snow-dressed winter day, Amtrak ACS-64 607 has just departed Newark Penn Station and crossed the towering Dock lift bridge over the Passaic River as it heads for New York City with a Northeast Regional train (above). Three miles further south and on a pleasant summer morning, ACS-64 639 is making its stop at Newark Liberty International Airport Station (below). 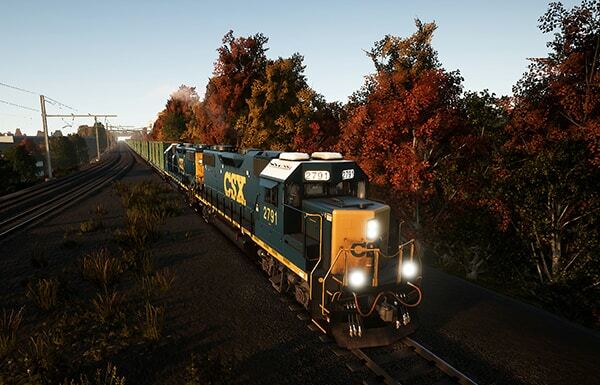 The upcoming Train Sim World Northeast Corridor New York route will offer freight as well as passenger railroading challenges. Near Newark Airport and the site of the Pennsylvania Railroad’s once busy Waverly Yard, a pair of CSX EMD GP38-2s in the railroad’s “YN3” livery prepare to switch cuts of covered hoppers and tank cars. 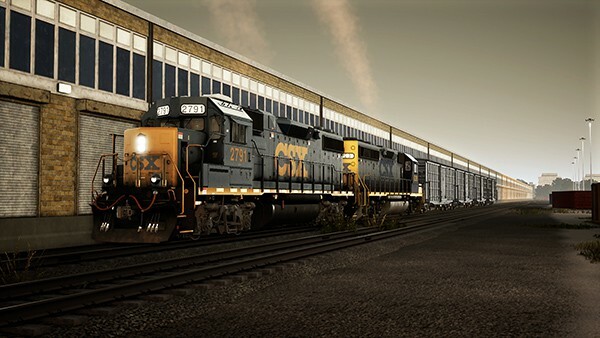 Among the freight duties you’ll have the opportunity to tackle on the Train Sim World Northeast Corridor New York route will be transfer runs between CSX’s Oak Point Yard in the Bronx and the New York & Atlantic Railway’s Fresh Pond Yard in Queens. Having departed Oak Point with a consist of flat-and-container cars, CSX GP38-2 2791 is on the point as the train climbs the Hell Gate Bridge’s northern approach (above), then a short time later rolls onto the CSX Fremont Secondary at Bowery Bay Junction (below). In addition to being home to CSX’s Oak Point Yard, the Bronx is host to a pair of busy sources of freight business. As dusk settles in the Bronx, CSX GP38-2 2791 and a sister CSX diesel are making a set-out at the Hunts Point Produce Terminal (above), while a pair of CSX GP38-2s are handling municipal waste loads at Harlem River Yard (below). At Oak Point Yard, CSX GP38-2 2789 awaits assignment as a southbound Amtrak Northeast Regional train scurries past on the Hell Gate Line. 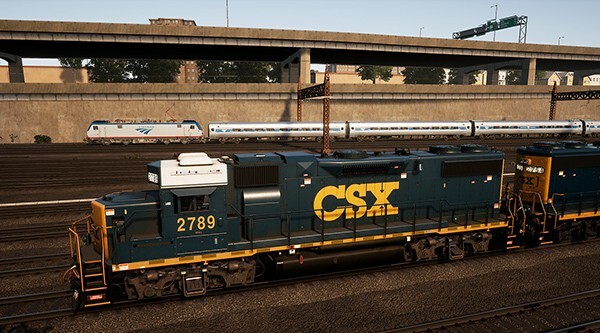 Bustling “Big Apple” passenger and freight action is coming soon to Train Sim World with the Northeast Corridor New York route!